Welded components - KMW Engineering Sp. z o.o. KMW Engineering has highly qualified supervisory, working, and inspection personnel, responsible for welding works during production and assembling processes. We offer production of welded ventilation products and construction of welded technical systems. Moreover, we offer components constructed in the stay-in-place formwork technology. 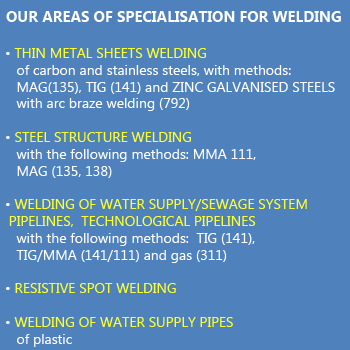 We specialise in welding of carbon steel with 111, 141, 135 and 311 methods (low-carbon steel) and with 135 and 141 methods (austenitic steels). The implemented WPQR welding technologies were approved by TÜV. Furthermore, we specialise in welding of "thin" steels, up from 2.00 mm. Our welders hold licences issued by IS and supervision licenses from TÜV. Additionally, we have highly qualified welders working in the area of arc braze welding of austenic and zinc or Aluzinc-coated metal sheets with an argon gas shield with the 972/131 method. This method is, for example, used for production of panel structures and ventilation ducts of the air tightness class D.
KMW Engineering holds a certificate for welding works, as we meet the requirements of DIN EN ISO 3834-2. The certificate was issued by TÜV Nord.